Get Rewarded for Drinking Local. Join the BeerGuys Craft Club for less than the price of a beer and enjoy exclusive rewards at your favourite Calgary breweries, restaurants & retailers. All while supporting local charities in need. Receive VIP event invites not available to the general public, including craft beer tastings, private parties, tours, beer launches and more. Discover great tasting new beers while giving back to your local community. 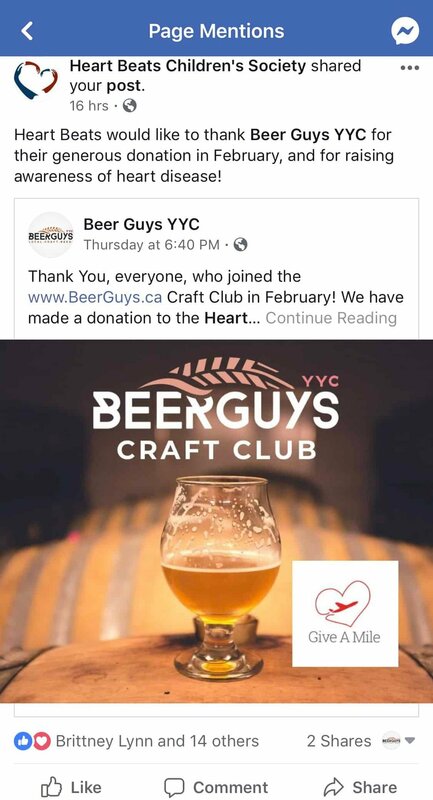 Each month the BeerGuys Craft Club supports a local charity in need. Whether you’re new to craft beer or a seasoned brewmaster, join a community of like-minded enthusiasts. *Claim this special offer throughout the Calgary Flames 2019 playoff run. Works on iOS, Android & Windows devices. By registering now you’ll lock in this special rate of $4.95 for the LIFETIME of your membership! You heard that right, lock in now and reap the rewards as your membership value continues to grow – 41 locations already in Calgary, and more to come! *Offer valid for the duration of the Calgary Flames 2019 playoff run. Once checkout is complete your membership card will be delivered by email. If purchasing this membership as a gift you will receive gifting instructions by email after you complete the checkout process. To purchase multiple gift memberships, please click here. We’ve got answers! Read on. What is the BeerGuys Craft Club? The Beer Guys Craft Club Membership Program is an exclusive group of like-minded individuals who are passionate about supporting local, love craft beer and want to continually explore and embrace the local craft beer scene. How does BeerGuys Craft Club work? Once you’ve purchased your membership, we’ll send you a personalized digital membership card to keep in your mobile wallet. Browse the online directory for a list of promotions and participating locations in your city. *Mobile app coming soon! Once you arrive at a participating location, simply show your membership card to receive your exclusive BeerGuys Craft Club offer! Yes. The membership fee is $7.95/mo. This helps manage the membership platform and support our monthly charity partners. Click the yellow “Join the Club” button below. Click the grey “Subscribe” button. I don’t have an iPhone, will my membership card work on Android? Our membership cards can be used across many platforms. If you don't have iOS, cards can be opened on the Passes Android app, and even in your internet browser. When you receive the email containing your pass, simply click the pass link URL and save the pass to your device. Can I purchase memberships as a gift for someone else? Absolutely! If you’d like to purchase a single gift membership for someone else, simply click “Join the Club”. You will have a gifting option once checkout is complete. To purchase multiple memberships for friends & family, please click here. In addition to maintaining the membership program, each month we donate a portion of membership fees to help support a different local charity partner. On your digital membership card (as well as the ‘Deals’ page) you will see exactly which charity you are helping to support! Not to worry, we use automatic monthly billing through PayPal so you never have to worry about your membership expiring. Each month, once your payment is successfully processed the expiry date on your membership card will automatically update for another month. Please ensure “Automatic Updates” are turned on in your digital wallet. ABSOLUTELY. The BeerGuys Craft Club welcomes anyone who is of legal drinking age. Nearly 50% of BeerGuys Craft Club members are women! How many deals can I redeem each month? You may visit as many participating locations as often as you’d like. However, please drink responsibly. This membership is not about over indulging, it’s about encouraging you to explore your community; to taste and promote products made right in your own backyard. As a member, will the promotional offer apply to the entire bill if I go out with non-member friends, or is it only me who gets the benefit? This depends on the individual location and their policies, however, typically no. The promotional offer only applies to the member’s portion of the bill. No. Since your membership card has your name on it you cannot give it to another person. However, you can easily refer a friend so they can get in on the action as well! How do I know which locations offer a special BeerGuys promotion? An ever-growing list of participating locations is available through the BeerGuys online deals directory. To access the directory, simply click ‘Deals’ in the top right corner of this page. How do I update/change my credit card details? If you signed up using your PayPal account (or created a PayPal account during the signup process) click here for detailed instructions. If you signed up without a PayPal account, click the blue button below and we’ll happily help! Thanks for letting us know! Watch for an email within the next 24 hours with instructions to update your credit card. You can cancel anytime, for any reason with just a few clicks. We hope you’ll stay, but we don’t make it hard to leave. If I cancel my membership can I return to the program and still get my old membership rate? Unfortunately, no. Your membership must remain in good standing to keep your current membership rate locked in. Since the membership program will continue to grow in value over time, we encourage you to lock in the current membership rate as soon as possible and keep your payment details up to date in your PayPal account. Yes, 100% secure! We use PayPal to process all transactions. Do you offer a group/corporate membership option? Yes we do! Our corporate membership options are great for any size organization, including sports teams, social clubs, and businesses. To learn more, please visit our Corporate Membership page. Did we convince you yet? Great!